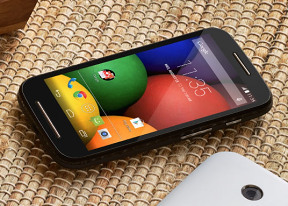 The in-call quality with the Moto E is decent, the earpiece is loud enough with clear voice. Motorola Moto E is among the few phones to score an Excellent mark in our loudspeaker tests, meaning you won't be missing calls and notifications even in the noisiest of environments. Moto E relies on the default Google keyboard for text input. It supports Swype-like gesture input, personalized dictionary, auto-correction and lots of languages. You can use Google's voice input too.